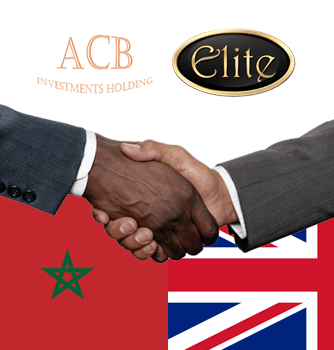 Elite Capital & Co. Limited has signed a deal with ACB Investments Holding to offer financial services in the region, such as implementing major infrastructure projects and providing project funding. London, UK (AGENCIES) Feb 8, 2017 — Today the Information Department of Elite Capital & Co. Limited (“ECC”) announced a deal with ACB Investment Holding in which the two companies will use their combined resources to provide project funding loans of 5 to 20 years for the construction of infrastructure projects by ECC. In 2006, ACB Investments Holding, established in Tangier, Morocco, is an international corporate finance and advisory company, with offices in Lugano, Buenos Aires, Hong Kong and Los Angeles, who serves private Multinational Enterprises, Sovereign Government bodies and International Agencies. In 2016, ACB Investment Holding has advised clients in transactions exceeding $1.5 Billion in value. The alliance between the two companies will also allow compliance-related activities to be carried out from two major international hubs of England and North & West Africa. This increases the international presence of these companies. Additionally, ECC has recently formed relationships with the owners of a number of high-profile UK-based properties and developments. ACB Investment Holding’s prestigious clients and network will provide the ideal forum in which to market these sites. ACB Investment Holding’s policy is to provide tailor-made solutions to their clients instead of using a ‘one size fits all’ approach used by many firms today. Elite Capital & Co. headquarters are located in England at the prestigious address of 33 St. James Square, London, SW1Y4JS, UK. This office is strategically located to serve their domestic and global clients by Board Members, Staff and Agents being located across the Middle East, Asia and Europe. ECC has multilingual staff to ensure that they can accommodate all of the client’s needs. ECC offers a wealth of experience in Banking and Financial transactions and has a range of specialized advisory services for private, SME or corporate clients. Also when required, Elite Capital & Co. can customize and structure their products and services to meet the specific needs of the clients. They will continue to customize, structure, create and implement funding products and services as the need requires. Elite Capital & Co., owned by Kuwaiti businessman Dr. Faisal Khazaal, has made a strategic alliance with ACB Investment Holding which has given them access to North & West Africa’s region, providing a substantial foundation of clients to build on, in addition to access to the markets that are most in need of the products and services they offer. The aim of ECC is to facilitate the commencement and completion of infrastructure projects, stimulate economy, create employment and combat poverty. “This relationship will serve to enhance our growing client relationships and business reputation of Elite Capital & Co.,” Mr. George Matharu, President of Elite Capital & Co., said.